College Station, Texas (EETV)- Auburn continued their dominance this season winning the SEC Championship over Texas A&M. Auburn, AL (EETV)- The 17-8 Auburn Tigers hosted the Arkansas Razorbacks on Wednesday night on The Plains. The Tigers had a 13-12 advantage over Arkansas, but were 1-5 against the Razorbacks inside Auburn Arena. Auburn came into the match-up with a 6-6 SEC record and the Razorbacks with a 5-7 SEC record. 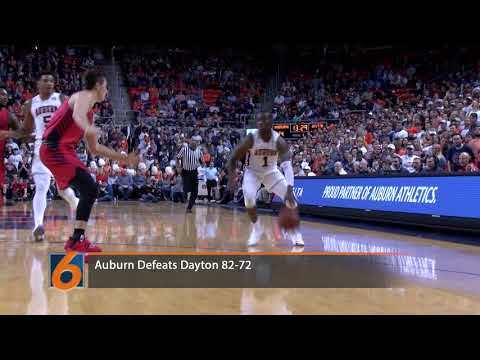 The Auburn Tigers faced off against the Dayton Flyers Saturday night in Auburn Arena. The Tigers looked to defeat Dayton for the second year in row. The Tigers showed out big in the first half with their high shooting percentage. Auburn shot 61 percent from the floor and 80 percent from the free-throw line, while Dayton shot 48 percent from the floor and only 50 percent from the free-throw line. Guards Jared Harper and Bryce Brown came out hot from the three-point line, Harper shooting 2-3 and Brown 4-5. Harper ended the half with 14 points and Brown with an impressive 22 points. Not only were the Tigers dominant on the offensive end in the first half, but their defense made a statement with a total of five blocks, three of which came from Austin Wiley. Auburn would enter halftime with a comfortable 51-32 lead. Bryce Brown and Jared Harper continued to be the leading scorers for Auburn as they would finish with a combined 54 points. Brown scored a career high 34 points and Harper finished with 20 points. The Tigers would remain on top as they win the hard-fought game, 82-72. Auburn improves their record to 8-1 and Dayton falls to 5-4. The Tigers will be in Birmingham Saturday the 15th in Legacy Arena as they take on UAB. Auburn defeated Liberty 53-0 with a strong performance on both sides of the ball. Auburn accounted for 541 yards of offense and Jarret Stidham threw two touchdown passes. Auburn's defense had a blocked punt, and two interceptions including one of a touchdown. Auburn will face off the Alabama Crimson Tide in the Iron Bowl next week.